The National Leader of All Progressives Congress (APC), Bola Tinubu, has urged the Lagos State Government to fast-track the demolition of buildings marked as structurally unfit. Tinubu said that the children who died in Wednesday's building collapse on Lagos Island did not deserve to die the way they did, describing the incident as tragic. In a condolence message made available by his Media Adviser, Mr Tunde Rahman, yesterday, Tinubu, commiserated with the families of the victims, praying that God would comfort them and grant repose of the souls of the young ones. 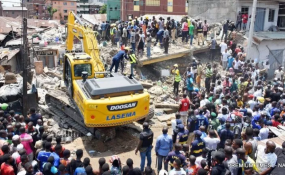 The News Agency of Nigeria reports that some pupils were among those who lost their lives after a three-storeyed building located on Massey Street, in Ita-Faji, Lagos Island, collapsed on Wednesday. The school was located on one of the floors of the building. Aside from the dead, many other persons were injured. The injured were taken to different hospitals for treatment. Tinubu said, "The building collapse in Ita-Faji, Lagos Island on Wednesday is a tragic occurrence. I commiserate with the families of those children who lost their precious lives. "They do not deserve to die the way they did. May God comfort their families and grant repose of the souls of those young ones. "If after the collapsed building had been found to be weak and marked for demolition and everybody had done what was required of them, perhaps this terrible incident would have been averted.